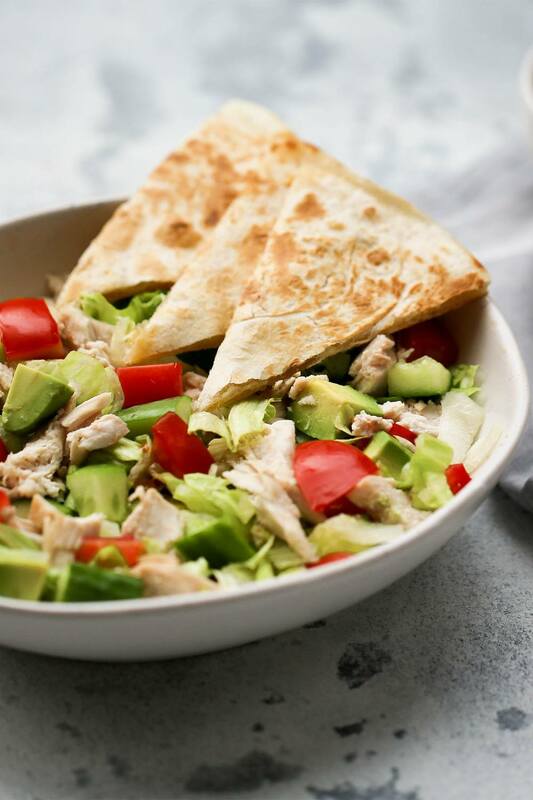 This Chopped Chicken and Cheesy Chicken Quesadilla Salad is everything you wanted in a salad. Healthy, Satisfying and Yum! To make your quesadilla, lay a tortilla flat on a plate, sprinkle with cheese and place another tortilla on top. If you have a sandwich press switch it on. While, the sandwich press is heating up, make your dressing by combining the sour cream, juice of ½ lime, cumin, paprika and salt and pepper in a small bowl. Set aside. Next, place the tortilla in a heated sandwich press and cook until cheese has melted and the outside is golden and crisp, or cook in a frying pan with a teaspoon of olive oil over medium-high heat, carefully flipping occasionally, until the cheese is melted and both sides are golden. Meanwhile, shred the chicken, then roughly chop the lettuce, tomato, avocado, cucumber and pick the coriander leaves. Divide the salad between two bowls. When your quesadilla is ready remove it from the sandwich press or frying pan and cut it into 8 slices. Arrange the quesadilla slices on the side of your salad bowl and finish with a big drizzle of creamy Tex Mex dressing.